Search for events. Tap , then enter text in the search field. The titles, invitees, locations, and notes for the calendars you’re viewing are searched. View a weekly calendar. Rotate iPhone sideways. Change your view. Tap a year, month, or day to zoom in or out on your calendar. View a list of events. In month view, tap to see a day’s events. In day view, Tap to view a list of events. Change the color of a calendar. 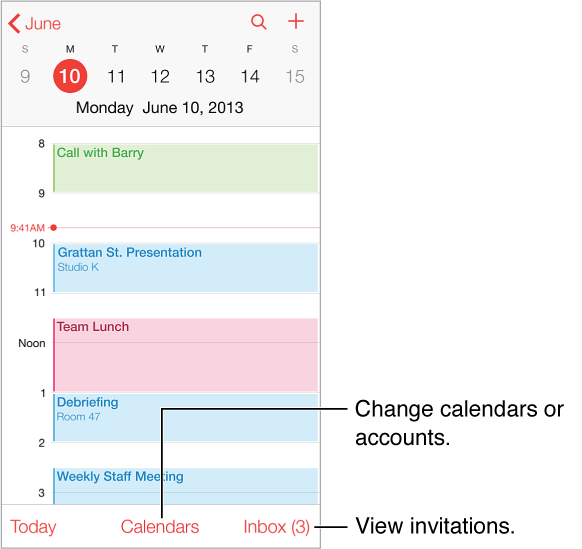 Tap Calendars, then tap next to the calendar and choose a color from the list. For some calendar accounts, such as Google, the color is set by the server. Adjust an event. Touch and hold the event, then drag it to a new time, or adjust the grab points.